This smart multicurrency Expert Advisor analyzes the signals of several leading, trend and psychological indicators, as well as the analysis of its own trade history to automatically make decisions on placing orders. Instructions on configuration of AI Synthesis EA can be found in my blog. The EA operation signals on demo and real accounts can be found and evaluated in my profile or in MQL4 Signals. Using signals of multiple leading, trend and psychological indicators combined with constant analysis of its trade history and with a minimum input parameters, the AI_Syntesis_EA was able to show good trading results (see the screenshots). To configure the EA, simply perform a correction of the indicator parameters in the strategy tester for each currency pair and on different timeframes, where you plan to use the EA. The smart algorithm of the EA automatically determines the number of its instances, equally distributes funds between them and determines the optimal lot size based on the funds allocated to an expert, allowable drawdown, trade history and the ATR indicator. Then, using the signals of the volatility indicator ATR and Fibonacci numbers, it calculates the Take Profit value, as well as TrailingStop for each currency pair, which is activated only after the criterion of profitability of a trade is discovered. Another advantage of the AI_Syntesis_EA is the hidden Virtual Stop Loss as a percentage of the allowable drawdown per trade set in PercentLossOrder, which prevents unscrupulous brokers from identifying its location on the chart and whipsawing it with volatility spikes. The whole picture of the expert's actions and the main parameters for its operation are shown in the deposit currency on a convenient panel (see the screenshot), which can be opened or closed using the Enable basic options button in the bottom right corner. Another advantage of the EA is the ability to trade on any currency pairs and any timeframes. However, it is recommended to use H4 and D1. 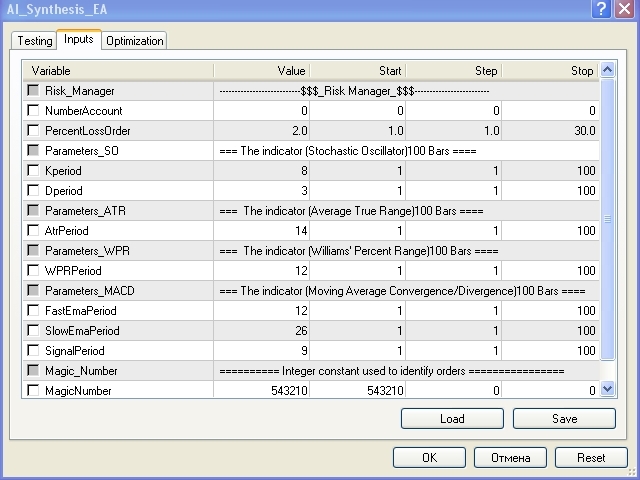 Risk Manager controls the number of the account it is attached to (see the screenshot). The EA does not work on accounts other than the one specified in NumberAccount. For multicurrency trading, attach the EA to a new window of another symbol, changing MagicNumber and modifying input parameters for a given currency accordingly. MagicNumber - integer constant used to identify orders.